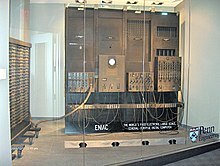 Varsity o Pennsylvanie Depairtment o Computer an Information Science, 3330 Walnut Street, Philadelphia, Pennsylvanie, U.S.
ENIAC (/ˈini.æk/ or /ˈɛni.æk/; Electronic Numerical Integrator and Computer) wis amangst the earliest electronic general-purpose computers made. It wis Turing-complete, deegital, an coud solve "a lairge cless o numerical problems" throu reprogrammin. ↑ Weik, Martin H. "The ENIAC Story". O R D N A N C E. 708 Mills Building – Washington, DC: American Ordnance Association (January–February 1961). Retrieved 29 March 2015. This page wis last eeditit on 11 Mairch 2018, at 21:18.